Stephen King’s stories are safe in the hands of Frank Darabont, the only director to show consistent success when turning King’s amazing ideas into amazing films. Shawshank Redemption is perhaps the best movie ever made, Green Mile isn’t too far behind, and even The Mist works on many levels; the guy just knows how not to butcher the beef. The novel was written as a monthly serial in six parts, later reprinted as one single book, so the film version had a lot of ground to cover, which is why its run time is around three hours long. But few movies have deserved that amount of our attention, few, other than epic adventures, even have that much to say, but the message of Green Mile is written boldly upon every page, and then directed masterfully through every scene. It’s a masterpiece if ever there was one, both a solid base and a stellar portrayal of the original content, a tale that simply has to be heard. During the Depression in the deep South, Paul Edgecomb worked on death row of a Louisiana prison, watched hard men come and go, live and die, walking down the Green Mile toward Old Sparky. The path between cells was laid with lime tiles, the electric chair down the hall gleamed with oil and with use, as Paul oversaw the executions of many residents of the Mile over the years, but none quite as remarkably as John Coffey. The crimes this simple-minded, larger-than-life, black man had been found guilty of were unspeakable, yet his manner was as meek as a mouse, and Paul found himself trusting John far beyond what his job title should allow. What’s more, Paul began experiencing first hand John’s special ability to feel and to heal, taking away the pain of others not simply emotionally, but physically as well, in a manner that could only be called a miracle. Tom Hanks has been in so many marvelous movies and has put on a show for us with his characters countless times, but his portrayal of King’s Paul Edgecomb has to be among his best ever, as he slides into the role in a seamless manner that I’m not sure has ever been done before. He leads the story, which starts as a flashback, through all its ups and down, and even through a few repetitive moments, which were due to the tale’s original format and couldn’t be helped. But that may be the only negative of the entire experience, other than an over-dramatic scene with a sick woman that I never cared for; the rest becoming the stuff of movie legend. The plot is fabulous, magical realism it’s called, and what a great way to put it; there is definitely something magical about this film. Tom Hanks, Michael Clarke Duncan, Bonnie Hunt, David Morse, James Cromwell, Patricia Clarkson, Michael Jeter, Graham Greene, Sam Rockwell, Barry Pepper, Jeffrey DuMunn, Harry Dean Stanton; what a cast. And I left Doug Hutchison, who plays Percy Wetmore, off the list so I could say that, although he never really became a star, he gave us a singularly despicable character that has become historic, one of the most detestable human beings to ever be crafted for the screen. 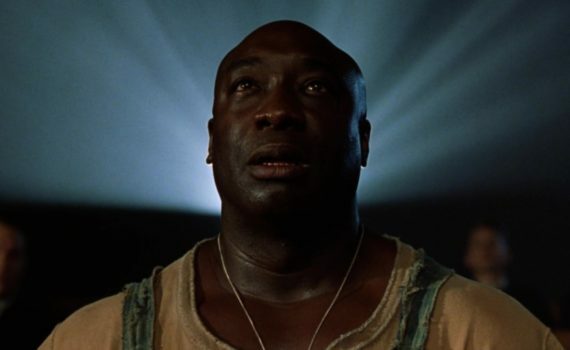 Green Mile takes these performances, this story, and Darabont’s directing talent, weaves it all together, draws audiences in, and makes an indelible impression that I am glad to be marked by.